Published: Aug. 24, 2016 at 04:01 p.m. Updated: Aug. 24, 2016 at 07:16 p.m.
Last season, breakout second-year players like Allen Robinson carried fantasy owners to championships, while surging veterans like Doug Baldwin catapulted plenty of fantasy teams over the top. Here in 2016, we'll look for the next crop of stars to outperform casual expectations. These potential breakouts can make your fantasy season and might be the reason you win your league. The key will be carefully assessing their situations, and making smart decisions about where to pursue them in drafts. Being aggressive to target the following breakout candidates is advised. The newly inked Bills starter was the 16th ranked quarterback in fantasy last season but eighth in points per game. He missed two contests with injuries, pushing him down the list in terms of overall rankings. You could argue that Tyrod Taylor's breakout occurred last year, but 2016 is where he establishes himself as an every-week QB1 option. Taylor offers a tantalizing ceiling on a week-to-week basis. He posted six 20-plus point outings and did so in three of his last six games. He scored fewer than 18 points just once in that stretch, which coincided with Sammy Watkins' establishment as a target hog in the offense. His penchant for going downfield also inflates his weekly ceiling, as his average depth of aimed throw (10.7) was the third-highest among starting quarterbacks last season. Lastly, his rushing ability gives you a safe floor to rely on every single outing. There is no reason to expect his 7.4 rush attempts per game from 2015 to drop. Everything in Taylor's outlook, from his own ability, tendencies as a passer and runner, and attachment to a high-end top wideout checks out for what you should look for in a fantasy QB1. He has top-10 upside that you can get in the waning rounds of your fantasy draft. Shortly after Super Bowl 50, Langford was a hot name going off the board around 24th overall in MFL10s with drafters correctly assuming Matt Forte would not return to Chicago. Then the great Mike Clay, now of ESPN, put out an excellent case against Langford citing his inefficient rookie season as a reason he wouldn't live up to the billing. Clay was right to point this out; the rookie averaged 3.6 yards per carry, struggled against traditional base defenses and caught less than 55 percent of his targets with eight drops. Despite that low catch rate, you can tell yourself a story where Langford performs much better as a pass-catcher this season. Langford's 4.9 average depth of target last season, per Pro Football Focus, was the highest among running backs who played at least 50 percent of their team's snaps. That means he saw far more downfield targets than the average running back typically does, which could have led to his poor rate stats as a receiver. He did still average 10.6 receiving yards after the catch, the seventh-most among running backs who played at least 50 percent of their team's snaps. If he sees more traditional running back-like targets he could be solid as a receiver, increasing his weekly floor. How good Langford is or isn't might not matter much at his now depressed cost hovering in the fourth to fifth-round. Even in his inefficient rookie season, Langford was the RB4, RB1 and RB17 in the weeks that he started for Matt Forte. This proves that not only do we know Langford has big-game potential, it is also just another reminder that opportunity is the king variable in evaluating fantasy running backs. That opportunity will definitely be there for the Chicago backfield as John Fox coached teams have ranked inside the top-10 in rush attempts in six of the last nine seasons. The only three where they finished 11th or lower were Peyton Manning's two berserk passing seasons in Denver and in 2010 when Carolina was the worst team in the NFL. With Langford showing well in the preseason and Jordan Howard reportedly not "pushing his way into the lineup," Langford looks in line for feature-back touches. New York Daily News' Ralph Vacchiano reported "it's clear" from talking to the Craig Johnson, the Giants' running back coach, that New York will scrap the four-way committee from 2015 and Rashad Jennings is now the No. 1 running back. We got a glimpse late last year what a Jennings-centered backfield would look like. Over the last four weeks, the Giants woke up and ditched that nonsensical split and gave Jennings 21.5 touches per game. The veteran back thrived with the workload scoring as the RB3 overall in fantasy during that stretch. With the addition of Sterling Shepard to the already dynamic duo of Eli Manning and Odell Beckham, the Giants are destined to be a top-10 offense this season. They were already sixth in points scored and 11th in plays run last season. You want a running back attached to an offense that will break the scoreboard like that. Jennings has all the black marks that send running backs down draft boards: old, oft-injured and a recent history of poor fantasy scoring. However, the circumstances have changed and he's a solid all-around player. He succeeded as a lead back on a poor Raiders team once before, and the Giants look to give him his best-case at a late-career breakout. The easiest breakout player to spot this season, it's about impossible to paint a scenario where Donte Moncrief doesn't shatter his already optimistic WR27 ADP. In the seven games Andrew Luck played last season, Moncrief averaged more catches (4.57) and touchdowns (.71) than T.Y. Hilton (4.43 and .43). Moncrief's Reception Perception results reveal that he already fully broke out as a player last year, becoming a complete receiver who ran the full route tree successfully. However, the world seems to have forgotten what he did in the early portion of the season because his stats fell off after running into Carolina and Denver before Luck went down for the season. Donte Moncrief was on a 123-target season-end pace in games Luck played, with Hilton maintaining a 148-target pace. That was with the now departed Coby Fleener and Andre Johnson absorbing 5.83 and 5.57 targets per game, respectively. A few weeks ago I looked at how any receiver who sees 120-plus targets is almost a virtual lock to finish as a no worse than a WR2 in fantasy, which would still be a value for Moncrief at ADP. Hilton and Moncrief combined for a 42 percent share of Luck's Week 1 through Week 9 targets. With the departure of the aforementioned two players and a severe lack of depth in the pass-catching corps beyond Phillip Dorsett and Dwayne Allen, the Moncrief and Hilton could push closer to a 50-percent share. Brandon Marshall and Eric Decker cracked that 50 percent mark last season, and Indianapolis' duo could be the 2016 version of that pair. Draft Moncrief with hyper-aggression. Pete Carroll expects the offensive approach the Seahawks utilized in the second half of 2015 to rollover into 2016. Seattle still maintained a healthy amount of rush attempts, but they went more up-tempo and got the ball out of Russell Wilson's hands faster. They became a more passing-centric team, not necessarily a pass-happy team. The shift in philosophy should cause us to reimagine how we project the Seahawks receivers. After recording what scores out as the second-best overall rookie season ever charted by Reception Perception (behind Odell Beckham), Tyler Lockett who demands our attention. Lockett posted an elite success rate vs. man coverage score of 76.6 percent. He came in with an above average SRVC score on every route on the tree outside of the screen. His 55.3 success rate on nine-routes exemplifies what a special deep threat he is, but his 87.8 and 88.9 percent success rate on curls and comebacks show us his true strength. An uncannily smooth route-runner, Lockett can break off a vertical route while selling the defender he's headed downfield. That leaves him wide open on a routine basis, and a tremendous target for one of the NFL's most efficient quarterbacks. You might not be able to project a strong target distribution for Lockett in this offense, but Baldwin showed last year Wilson's receivers are an exception to normal target threshold rules. The Lions have been one of the most pass-heavy offenses in the NFL with Matthew Stafford under center. In Jim Schwartz's five years as head coach, Detroit ranked sixth, third, first, first and fifth in the NFL in pass attempts. Jim Caldwell brought the volume down to its lowest point in 2014 (11th) but they crept back up to fourth last year. Despite that tendency, one of the team's starting receivers who they dished out $20 million to guaranteed in free agency hasn't cracked the top-30 receivers in ADP at any point this offseason. Marvin Jones is poised to absorb the bulk of Calvin Johnson's vacated 140-plus targets and enjoy his first true breakout season. His high success rate on short to intermediate routes in his Reception Perception profile is a perfect fit for an offense under Jim Bob Cooter that averaged just 6.7 depth of aimed throw. This combination made him one of my must-own receivers last month. Jones' career 37.5 touchdown-per-target rate in the red zone underscores that he's the best traditional insidet-the-20s threat on this team. 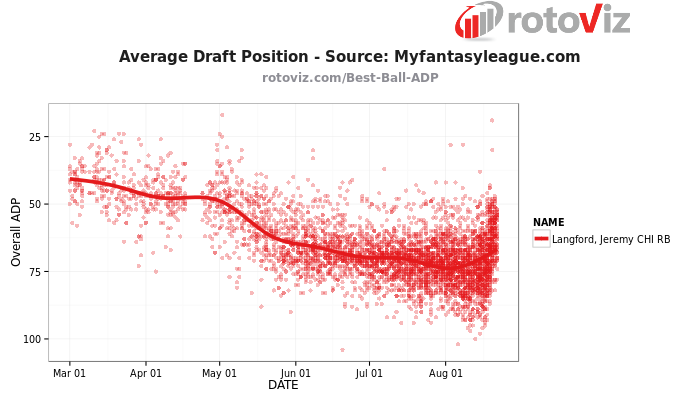 It's all lining up for Jones to be a WR2 or better in fantasy this season and his ADP still presents a value. The 2015 fifth-round draft pick started off his career with a bang going for 419 yards and two touchdowns in his first four games. However, Stefon Diggs tailed off in the NFL's lowest volume pass attack (league-low 454 attempts last season) failing to crack 70 yards in any contest the rest of the season. Diggs' Reception Perception reveals that he still earned consistent separation throughout the season, even when the production did not come. His 71.3 percent rate when facing man coverage was the fifth-highest mark among rookies charted over the last two years, ahead of Amari Cooper and Martavis Bryant, and trailing only Odell Beckham, Tyler Lockett, John Brown and Allen Robinson. Clearly, Stefon Diggs is a precise and talented receiver, but there's also reason to project a solid uptick in his volume. Diggs maintained a 103 season-end target pace in the 13 games he played, but still led the team in targets anyway. With all reports indicating Laquon Treadwell won't open the season as a starter and Diggs will be the No. 1, no one will threaten the second-year wideout's workload. If the Vikings kick up their pass attempts to just the 27th most in the NFL, Diggs could push for 120 targets. Of the 116 wide receivers who garnered 120 targets or more since 2011 only 23.3 percent of them finished outside the top-24 in that season. Diggs could sneakily finish in the WR2 range and goes for dirt cheap in the eighth or ninth round. On average over the last three years, Chip Kelly's teams ran 114 more plays per season than the 49ers. Kelly's high-paced offense creates a rising tide for all skill position players in San Francisco, allowing for more opportunities for touches and the subsequent production. One of the players that could be a prime candidate to do so is the little-known third-year receiver, Bruce Ellington. After diving into the tape of his new roster, Kelly came away impressed with Ellington. "When you look at just the short time that I've seen just film of him you're like 'Wow.' That kid can do some interesting things," Kelly told Matt Maiocco of CSN Bay Area. After catching that praise, Ellington ran as the starting slot receiver in OTAs. That buzz continued with overwhelmingly positive reports out of training camp as Ellington excelled in that role. Per Pro Football Focus, Eagles receiver Jordan Matthews ran 533 routes from the slot last season, second most among NFL receivers. Matthews racked up 229 targets in his two years playing under Chip Kelly. Of course, he could change up his tendencies with new personnel, but there is a history of a productive role for Ellington to walk into. The data on Ellington was limited, but Reception Perception took a small look at Ellington. He only ran 77 routes in his sample, which is a minuscule glimpse, but he did score out above average at defeating man, zone and press coverage. He profiles as both the type of athlete that Kelly coveted in his time with the Eagles and the checkdown-type relief option that Blaine Gabbert often defaults to. With the 49ers set to find themselves in plenty of negative, pass-happy game scripts, a coach with a history of production based on volume and a solid brief showing in Reception Perception, there are plenty of factors working in Ellington's favor. A 70-catch season is not outside of the realm of possibility. The Colts let Coby Fleener walk out of the door for a big money deal with the Saints this offseason but retained Dwayne Allen with a contract including $16 million in guarantees. Most of Allen's reasoning for returning had to do with a discussion he had with new offensive coordinator Rob Chudzinski about his role in the offense going forward. Chudzinski is a tight end guru going back to his days as a position coach at the University of Miami. His top tight end over his last six seasons has averaged 10.9 fantasy points per game. Allen is a talented player but injuries and splitting time with Fleener slowed down his fantasy production. At least one of those variables is out of the way for 2016. Allen is a maven at the most important aspect in accruing fantasy production at his position, scoring touchdowns. This veteran tight end scored on a ridiculous nine of his 14 career targets inside the 10-yard line throughout his career. He and Donte Moncrief are the only two pass-catchers on the team who profile as traditional red-zone threats. If Andrew Luck gets back to the 35 to 40 touchdown range again, Allen could push for close to 10 scores. If you want to close the article, or just throw the computer or mobile device on which you're reading this in the trash can at this point, that's understandable. However, there's an all too real possibility Jared Cook finishes a TE1 in fantasy this season. All offseason we've spent time hand-wringing over who the third wide receiver would be, but the answer might have been Cook all along. It seems like ages ago but Jermichael Finely was once an important part of the Packers offense. During his two most prominent seasons (2011 and 2012) he averaged a 16.5 percent share of the team's targets. He turned one of those seasons into a top-five tight end campaign and the Packers have desperately been trying to fill that role since Finley's career ended with a neck injury. If you project Cooks for that level of market share on the Packers' 565 targets from last season that equals out to 93 targets. Just using Cook's rate stats (57 percent catch rate, 3.3 touchdown rate, 12.8 yards per reception) over the course of his career on that workload you get 53 catches, 678 yards and three touchdowns for a total of 85.8 standard fantasy points. That would have been the TE13 last season. Now, there's the matter of the quarterbacks Jared Cook played with throughout his career. The list of heroes includes Matt Hasselbeck, Vince Young, Kerry Collins, Rusty Smith, Jake Locker, Sam Bradford, Kellen Clemens, Austin Davis, Shaun Hill, and Nick Foles. If the best quarterback in the NFL improves Cook's rate stats just a tad, he has the opportunity to have a career year and sneak into the top 10 tight end rankings.